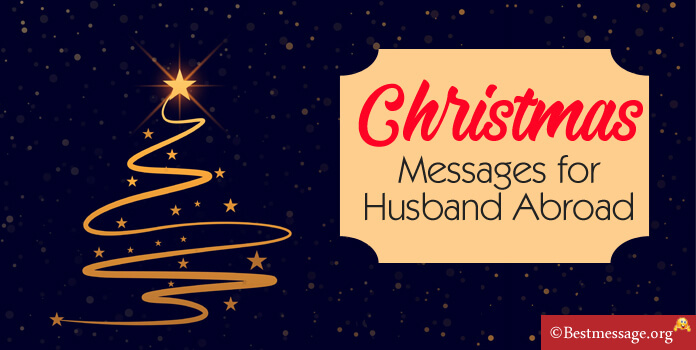 Such sample Christmas messages 2016 expresses the feelings of wife to husband who is far away. Given below are some messages. 1). Dearest husband, you are not here to celebrate Christmas with me but your heart is connected with mine for life… Warm wishes and lots of love on Christmas… love you!!! 2). We may not be there to celebrate this holiday season with each other but our love and wishes are always there for each other… With lots of love, wish you Merry Christmas. 3). No distance has the power to separate us… I am sending you best wishes for this festive season wrapped with love and warm hugs… Merry Christmas to my lovely husband!!! 4). This Christmas you are not here and I am missing you very much. My wish to Jesus is that he blesses you with happiness and good health forever. Merry Christmas, my love! 5). This year you are not here with me to decorate the Xmas tree or buy me a surprise gift. This year you are not here to love me. My adorable husband, I miss you and you love. Sending warm Christmas wishes to you. May Santa Claus bring you as my surprise gift this year. Love you. 6). Though I cannot see you or feel you but you are always in my heart and connected to my soul. Let us pray to God on Christmas 2016 to bring us together with each other. Wishing you a wonderful Merry Xmas my love. I miss you on this special day which is incomplete without you. 7). This Christmas I want to let you know how special you are to me throughout the year. I will really miss you while celebrating this Christmas. Merry Christmas, dear husband. 8). This Christmas, I want to wish you all joy and happiness all the year through. I hope you have a very Happy Christmas. 9). Merry Christmas dear husband. Missing you a lot as you are not here .Sending you all my love this Christmas. May all your dreams come true. 10). Since so many years, we have been celebrating Christmas together. This Christmas we are apart, but my heart is with you. Merry Christmas, my love.